Protactinium is a radioactive actinide with little known about its properties and no known commercial or industrial uses. It is a very scarce element, with only a few parts per million available even within uranium ore, the study of which led to its discovery. Protactinium’s decay chain leads to actinium, and thus its chemical element name refers to Proto-actinium. 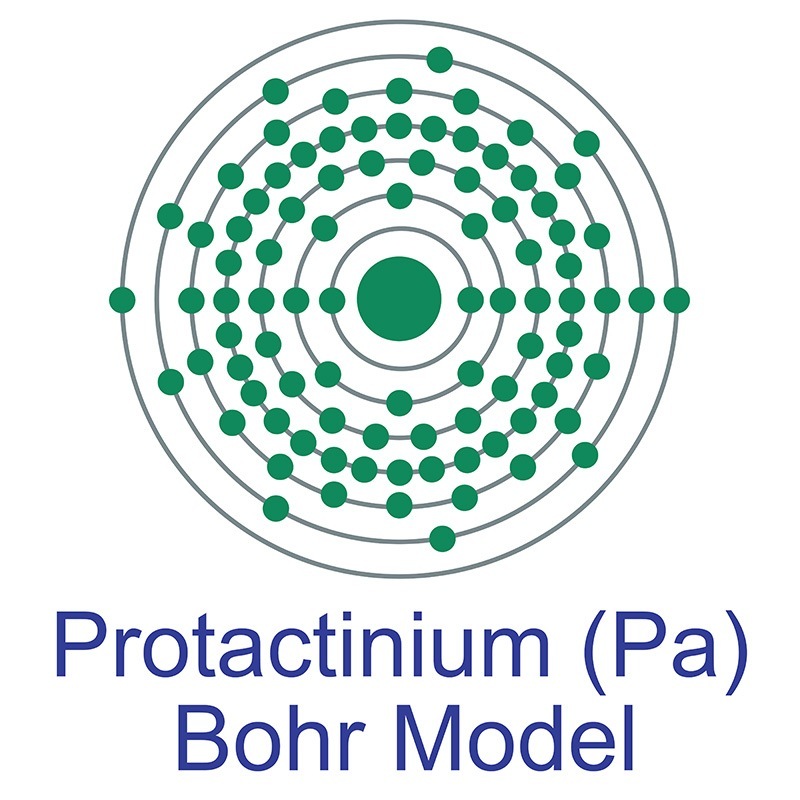 The most stable and abundant isotope of Protactinium (231Pa) has a half-life of 32,760 years and is itself produced through the decay chain of uranium (235U). Protactinium is an undesirable intermediate product in thorium-based nuclear reactors and must regularly be removed from the environment. Naturally-occuring protactinium isotopes in water are used along with uranium and thorium to date sediments and model geological processes. Kasimir Fajans and Oswald Helmuth Göhring are credited with first identifying the protactinium element in 1913. However, full credit was never assigned for the discovery until 1917 when a stable isotope was discovered by Otto Hahn and Lise Meitner of Germany and Frederick Soddy and John Cranston of Great Britain. The first isolation of the element is credited to Aristid V. Grosse in 1934. Though many chemists have been acknowledged with having predicted, discovered, isolated, or produced the element since the year 1900, the element didn’t take its final form in the periodic table until 1949 when protoactinium was shortened to protactinium. Its discovery filled the last remaining gap in early versions of Mendeleev’s periodic table. In 1961, the United Kingdom Atomic Energy Authority produced 25 grams of protactinium for an estimated cost of one half-million dollars – which long stood as the world’s only supply of the element for scientific studies. However, Oak Ridge National Laboratory now produces and sells protactinium in small quantities. Protactinium is a bright, shiny metal that forms compounds with the halogens and with hydrogen, though there are no known practical applications of any such compounds. Sitting between useful elements such as thorium and uranium on the periodic table, protactinium is itself not as useful as its neighbors. It is simply too scarce, radioactive, and toxic. Twenty-nine isotopes are known to exist, all of them radioactive. The isotopes all decay into actinium via alpha or beta chains depending on its isotope number. And though this element is rare, it can be found in minute amounts throughout Earth’s biosphere. Protactinium is a radioactive actinide group metal with the atomic symbol Pa, atomic number 91, and atomic weight 231. It decays by alpha-emission. It is a Block F, Group 3, Period 7 element. The number of electrons in each of Protactinium's shells is 2, 8, 18, 32, 20, 9, 2 and its electron configuration is [Rn] 5f2 6d1 7s2. It has an atomic radius of 163.pm and a Van der Waals radius is 243.pm. In its elemental form protactinium's CAS number is 7440-13-3. It is found in the form of two isotopes: protactinium-231 and protactinium-234. Protactinium was first predicted by Dmitri Mendeleev in 1869 and first isolated by William Crookes in 1900. It was named by Otto Hahn and Lise Meitner in 1917. The name Protactinium originates from the Greek word 'Porots' which means first. Protactinium is both toxic and radioactive. Protactinium information, including technical data, safety data and its properties, research, applications and other useful facts are discussed below. Scientific facts such as the atomic structure, ionization energy, abundance on Earth, conductivity and thermal properties are included. Protactinium has three naturally occurring isotopes, none of them are stable.